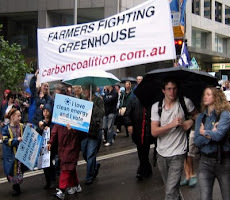 Carbon Coalition Against Global Warming: National Carbon Cocky of the Year 2012 is Shane and Shan Joyce! National Carbon Cocky of the Year 2012 is Shane and Shan Joyce! 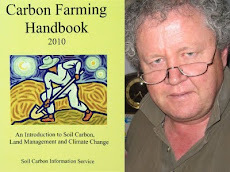 National Carbon Cocky Award for Soil Sequestration Performance (Sponsored by YLAD Living Soils): Craig Carter, "Tallawang", Willow Tree NSW. • Ian & Dianne Haggerty run a mixed cropping and grazing enterprise on low rainfall and sandy soils on properties totaling 8000 hectares in the Wyalkatchem, Dowerin, Cunderdin and Meckering districts north east of Perth WA. They use biological fertilisers and zero tillage and produce high tonnages of premium grain per hectare. Healthy ground cover helps to maintain high soil moisture and weed control. • The Haggertys have developed their own line of Merino sheep from local and South Australian bloodlines bred to be acclimatised to the land farmed over a number of holdings. This diversity has enabled more effective management across various landscape conditions and rainfall availability. Sheep bred to adapt to the local environment lambing at 90%-150% and producing high quality 17-20 micron wool. • They use livestock as “weeders, seeders and feeders” in regenerating pastures. Each of the properties managed by the Haggertys produce cereal grains, hay andsheep for wool and meat. • The inclusion of leased land and share-farming enterprises in various locations gives the option of different soil types in different rainfall zones. • Ian and Dianne use no-tillage direct drilling of grain seed, supported by biological fertilisers, based on high grade worm liquid and compost extract at $30 a hectare. Cereal stubble and areas of perennial shrubs – Rhagodia, saltbush and tagasaste, - provide grazing for sheep in summer and autumn..
• Enhanced microbial activity in the soil and the use of specially-bred sheep as the ‘farm machinery’ above the surface has lifted the resilience and fertility of the land, improving the soil function, structure and water-holding capacity. • The Haggertys prefer older varieties of grain that were in common use before the introduction of chemical farming. A low pressure liquid fertiliser circuit is built into their seeder so that the microbiologically coated seed is drilled into a microbial environment stimulated by the liquid fertiliser. • The plant root growth breaks up sub-surface hard pan in heavier soils, the result of earlier farming methods. Extensive root system growth is stimulated and the plant is able to reach wider and more deeply for moisture and nutrition by not providing water soluble fertilisers with the seed. Root growth in the poorer sandy soils adds carbon and nutrients, hold the soils together and spread the microbial environment. Healthy plants slow down runoff. Microbial activity and improvement in soil structure maximizes moisture retention. • Stubble of the crop grown in a rich microbial environment provides nutritious fodder for the sheep. Their breeding and cellgrazing practices mean the sheep are resistant to stomach parasites and do not require drenching. The sheep have been bred for clean legs, faces and crutches; the Haggertys do not practice mulesing but maintain regular crutching. The sheep thrive on cereal stubble and native shrubs and grasses as their rumen flora is adapted to maximising nutrient extraction from roughage. • The grazing operations are integral to the whole. The cropping and hay production contribute to the production of premium wool and lamb, but the sheep are playing their part in fertilising the land. • Bill and Rhonda Daly produce cereal, canola and legume crops, prime lamb, and humus compost on 1182 hectares. • Prior to 2001 they ran a mixed farming enterprise of a self-replacing merino flock, prime lamb production and backgrounding of steers. They used set stocking. Crops were managed as a traditional rotation, using four passes of cultivation and sowing. Fertiliser programs led to a ‘watery’ plant, increasing both pest and disease issues, declining fertility, particularly soil humus and ever-increasing soluble minerals inputs. • The Dalys undertook extensive education to understand how to balance soils, creating greater soil pore space for oxygen and water, enabling the chemical and biological aspects to function to their potential and to understand the function of trace minerals in enzyme production and animal health. Further study was undertaken in the United States in the Advanced Composting System (Humus Technology®) to produce humus compost and extracted compost tea from local waste. • Cropping management was changed to No-Till, stubble retention, reduction and buffering of soluble ‘down the tube’ fertilisers, introduction of Microbial Liquid Injection system and introduction of biological fertilisers and inoculums. The Dalys moved away from monoculture crops on the 350 cropped hectares of the property, and instead began under-sowing legumes such as clover under crops to supply nitrogen. • But the key innovation implemented to restore humus to the soils and restore the natural biological balance is humus compost. Compost materials are combined to ensure a carbon to nitrogen ratio of 25-30:1. This ratio enables the correct temperature and carbon dioxide cycle, ensuring pasteurisation of any e-coli, salmonella and weed seeds. Feedstocks are tested for heavy metals. The improvement in soil structure and plant health does not come from the quantity of compost applied. Instead, it is a catalyst that supports natural system functioning. • Humus improves soil structure by aggregating soil particles and stimulating soil microbes to do the same. Improved structure allows air and water to enter the soil, and allows roots to access more water and nutrients”. • On Milgadara, overall mineral balances have nearly reached ideal balance. Earthworm activity has increased and visible signs of soil fungi present. Soils are now sweet smelling and stubble residues are breaking down rapidly. Organic matter levels have increased from 2% to 4%. • The success of their compost regimes on Milgadara encouraged Bill and Rhonda to establish a commercial composting operation, YLAD Living Soils. With two full time compost makers, the Dalys now have a client base of over 2000 people. • Bill and Rhonda also attended the RCS course on stock management and grazing practice. The carrying capacity of the farm has increased. Lambing percentages are up to 150% in cross bred ewes and 120% in Merino ewes. They now have more diverse pasture species, including bi-annual and perennial. With rotational grazing management pastures are now becoming stronger and more diverse with less weeds”. • Education has continued over the past ten years as the couple have spent $100,000 including over 15 trips to the United States for study, and courses including RCS, Soil Foodweb and Nutri-Tech Solutions. Ylad also stages an annual seminar and field day with overseas experts. • Michael & Edwina Beveridge of Blantyre Farms near Young recently installed a methane digestion system at both piggery sites. They are the first people in the Australian pig industry to complete a commercial digestion system. 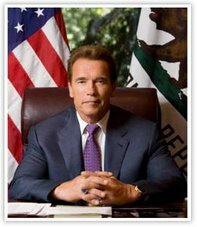 • Their application for the right to earn carbon credits under the Carbon Farming Initiative has been approved. • They have a 2000 sow piggery near Young. At any point there are about 20-25,000 pigs on hand. There are two separate piggery sites, a breeder and a grower site. • Blantyre Farms has recently installed a methane digestion system at both piggery sites. They are the first people in the Australian pig industry to complete a commercial digestion system. • Normally methane is released into the atmospheres from the anaerobic decomposition of pig manure in settling ponds. A methane digestion system captures this gas produced under a pond cover and burns the methane. The methane gas when burnt is converted to carbon dioxide. Methane has a Global Warming Potential of 21 versus carbon dioxide at 1; ultimately methane is 20 times worse than carbon dioxide. • To set up this system a new dam was constructed at each site, they hold 50 days worth of effluent. This dam at the grower site, holds 15ML, is over 100m in length, 40m wide & 5m deep. The breeder site dam is about a third the size. • The dam has been covered with 2mm LDPE covers. There is a flare on each pond, this is back up for the generators and will burn the methane, if the generators stop. The gas runs from the pond through a scrubber, which cleans the gas of impurities & then a chiller which removes condensation, it is then piped to the generator. • The generators. are containerized, to reduce noise and allow easy transportation. There are 2 units at the grower site & 1 at the breeder site. In summer all three will operate, in winter it is anticipated that there will only be enough gas to run 1 at each site. This also provides a spare, which we can move from site to site if required. • The methane gas is a fuel source for a converted diesel engine, which is coupled to a generator. Blantyre has 3 x 80KW generators. • Both separate digestion systems are connected with a pipe that runs for 3.8km & goes under a main road. This allows flexibility & will keep the gas up to the breeder site which uses the most power, but makes less gas. • Blantyre expects the project will have between a two and three year pay back period. The greatest saving has been in producing power for their own use, as electricity charges are about 20c/kW. There is a smaller benefit in selling power to the grid, where Blantyre receives about 3.5c/kW. 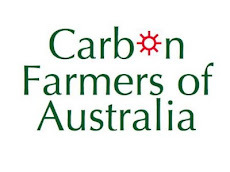 • Australian Pork Limited, the industry body has been proactive with the Carbon Farming Initiative and has registered a methodology “for the destruction of methane generated from manure in piggeries”. This methodology has been approved. • “Tallawang” is a beef cattle and sheep trading enterprise on 445 hectares, purchased in 2001. Cell grazing was introduced in 2002. Yarramanbah Creek, which runs through the property, was fenced and tree corridors were planted. In 2005 a series of leaky weirs was constructed along the length of the creek to retard water flow and re-establish the original chain of ponds. • The existing contour banks in higher country were modified in 2009, by blocking them at intervals to form swales that retain and more effectively use water in the upper parts of the landscape. This process has enabled surface water to infiltrate higher in the landscape, thus maintaining the quality and quantity of the pasture longer in the drier times. By enabling more water to be absorbed into the soil, the pastures are more lush resulting in the cattle tending to walk less to find the water trough. 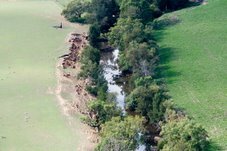 • Some slashing has been used since 2010 in combination with cell grazing on creek flats to increase soil organic matter and encourage regeneration of native grasses. As a result, water is retained in the landscape for longer, being readily available for plants and animals. • Craig employed Peter Andrews to design creek structures, establishing a series of leaky weirs in the creek. These were constructed mainly using dead trees in conjunction with later plantings of common flag reed. Improved hydrological function ensures maximum infiltration, extending the growing season of the grasses and providing greener pastures. • When introducing cell grazing, Craig elected to use a ‘wagon wheel’ fencing design, where paddocks are arranged radiating from a water point at the centre, and single-wire electric fencing for cost-effective grazing management. • No gates: one simply lifts and drives under, or drives over the fences. The internal permanent fences that were present in 2001 have been removed. There are now around 100 small triangular shaped paddocks arranged in six cells, fenced with sparsely spaced steel posts and a single strand of high-tensile electric wire, running 3000-4000 volts. The simple construction allows fencing layouts to be easily moved or modified to suit landscape needs. Fences are only turned on around individual paddocks being grazed, and the cattle know when the fences are turned on. Each paddock is grazed for no more than three days out of every 90 days.